COVINA, Calif. /California Newswire/ — The Senior Artists’ Art Exhibit – Collection from the Treasure Chest, held by H.H. 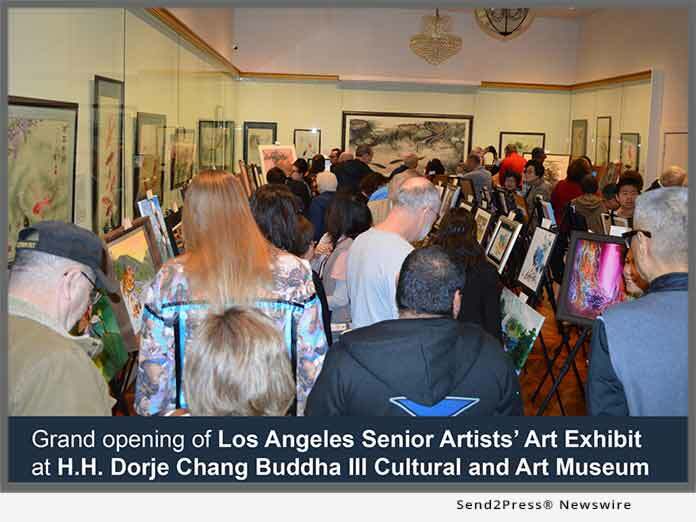 Dorje Chang Buddha III Cultural and Art Museum, had its Grand Opening at the museum on January 26, 2019. Senior painting artists from both the main-stream and Chinese societies in many cities, turned their rich live experiences into color brushes, and they sketched, outlined and drew their ideologies and expectations about mankind and the world into wonderful paintings, painting the splendid world in their eyes and showed the richness and colorfulness of the spiritual lives of theirs. This exhibit is a rare exchange in painting that is held for the seniors from different ethnicities in Los Angeles. According to the H.H. Dorje Chang Buddha III Cultural and Art Museum, this exhibit showcases more than 60 paintings by artists from various senior centers and art organizations, including Pasadena Senior Center, the Palomares Artist Workshop, the Ray Tucker’s Watercolor Art Class in La Verne, Mt. San Antonio College Older Adult School, Arcadia Recreation Center, Kinsley Manor and the Walnut Grove Art Association. Artworks by Ms. Wu Hua, a director of the Chinese International Calligraphy and Painting Artists Association, are also displayed. The museum said that although there are many art exhibits in Los Angeles, those exhibit specifically held for seniors across different races and areas are very rare. No matter they are professionals or amateurs, it is obvious from the paintings on exhibit that these silver-haired folks live very spirited and invigorating lives. They transform their unique life experiences, their expectation about human kind and the world, and their ideals into paintings and show their hearts. Seeing their paintings not only can move and inspire people, is significant in education for the mass in the society, but also can help to improve mutual understanding and integration among the various cultures and ethnicities. By holding this art exhibit, it is hoped that more seniors will attend such activities in the future. Among the many community leaders, art experts and VIPs attending the opening ceremony are Mr. Aldo Ramirez representing State Senator Susan Rubio’s office of the 22nd District, Councilman Dr. Allen Wu of City of Walnut, Dr. George Shannon, an associate professor of the USC’s Davis School of Gerontology, Mr. Jim Berry, a faculty member at Caltech, Mr. Ray Tucker, an art teacher of the Mt. San Antonio College, and Ms. Wu Hua, Director of Chinese International Painters Association. State Senator Susan Rubio’s office and Councilman Dr. Allen Wu each presented a certificate to H.H. Dorje Chang Buddha III Cultural and Art Museum. Councilman Dr. Allen Wu of City of Walnut ceremony highly praised H.H. Dorje Chang Buddha III Cultural and Art Museum for holding such a meaningful art event. “It not only enriches the cultural lives of the community but also brings Chinese art and culture as well as the elegance of art by the seniors to us,” he said. The Los Angeles Senior Artists’ Art Exhibit-Collection from the Treasure Chest is open for three weeks and will be closed on February 16, 2019. This is a public beneficial and free event. All is welcome to come and visit the exhibit. The address of the H.H. Dorje Chang Buddha III Cultural and Art Museum is 170 E School St., Covina, CA 91723; the phone number is (626)281-6378. H.H. Dorje Chang Buddha III Cultural and Art Museum is remodeled from a 116-year old two-story historical building. It was formally opened on June 7, 2014. As an IRS 501(c)(3) non-profit organization, H.H. Dorje Chang Buddha III Cultural and Art Museum not only promotes art and culture but also constantly concerns itself with disadvantaged groups in the society in order to contribute to the development of the community, improve social stability and increase fortune and happiness of families. Since its opening, the museum has held many art exhibits and art contests for young students and autistic youths. Those events provide opportunities for the younger generations to present their own artworks, encourage students having talents and working hard to pursue artist development, and calls the attention by the society towards the various groups.